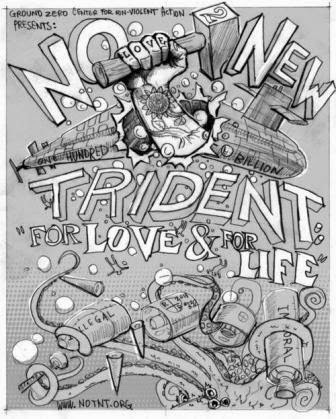 NO To NEW TRIDENT - For LOVE & For LIFE: First come the new subs... next will be new missiles! First come the new subs... next will be new missiles! The Trident (OHIO Class) Replacement Program is going full steam ahead. The following article makes that quite clear. The most intriguing statement made is that "OR subs will initially carry the Trident II D5LE missile." The keyword here is "initially." 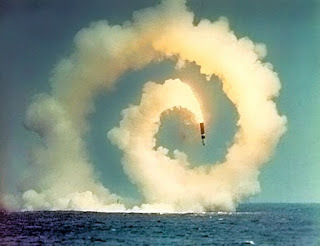 The Trident II D-5 was first deployed in 1990. Lockheed Martin is still building the Trident missile in Sunnyvale, California, and the Navy recently completed the 154th and 155th successful,consecutive test launches. The Trident II D-5s are currently being upgraded to give them 25 more years of service life. With the new subs planned to be deployed into the 2080s it is highly probable that the Navy will be pursuing a replacement missile well before the end of the missiles' extended service life. And that will be a big ticket item that no one is currently discussing. The ultimate question (and really the elephant in the room) is - Why we are building a new generation of ballistic missile submarine that is planned to be deployed almost to the end of the century when it only serves to foster a rapidly developing nuclear submarine arms race? Is there no end in sight? Or would it be more appropriate to say that the end will be in sight should the U.S. (and other nuclear nations) continue down the road of nuclear modernization??? Will this enter the conversation at the upcoming Nuclear Non-Proliferation Treaty Review Conference? Let's hope so. With concrete accomplishments in the previous year, the U.S. Navy’s Ohio-class submarine replacement (OR) program looks to be in good shape, according to the recent annual report of Pentagon program reviews by the U.S. Government Accountability Office (GAO). “In 2014, the contractor and the Navy completed ship specifications and set the ship’s length, both major milestones, as it commits to the space available for ship systems,” GAO says. Adm. Jonathan Greenert, chief of naval operations, has made it clear repeatedly that the OR is the Navy’s number-one priority acquisition program. GAO estimates it will cost about $95.8 billion to buy 12 submarines, which breaks down into $11.8 billion for research and development and about $84 billion for procurement. The new boats will replace the current fleet of Ohio-class ballistic missile submarines (SSBNs) as they begin to be retired in 2027, GAO notes. “The Navy began technology development in January 2011 in order to avoid a gap in sea-based nuclear deterrence between the Ohio-class’s retirement and the production of a replacement,” GAO says. The Navy is working with the U.K. to develop a common missile compartment for use on OR and the U.K.’s replacement SSBN, GAO says, and the OR subs will initially carry the Trident II D5LE missile. “The Navy is continuing to develop and evaluate new technologies to incorporate into OR, including an X-stern configuration; a new propulsor; and an extended-life drive shaft that, according to program officials, will increase the platform’s availability,” GAO reports. The Navy plans to complete 83% of the design disclosures – the detailed plans used on the shop floor – prior to the start of construction, GAO says. Last October, the program awarded a contract for production of 17 missile tubes, one of the boat’s critical subsystems. “According to program officials, these tubes will support the quad pack prototype, testing, and also the United Kingdom’s replacement SSBN,” the report said. Multi-year contracting, GAO emphasizes, is allowed by statute if, among other things, the design is stable, technical risk is not excessive, and the cost estimates are realistic. “It is typically not used with lead ship construction because of the unknowns inherent in Navy lead ship construction,” the report says.